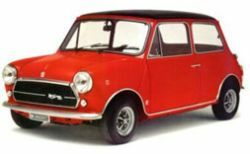 The Mini began it's public life on the 26 August 1959, at that time Sir Alec Issigonis could not have even dreamed of the importance his little car would play in the history of the motorcar. The Mini was designed simply to be an affordable car which could seat four adults and still be small enough to cope with the increasing numbers of cars on the road. Costing just under £500 and initially only available with a 850cc 34bhp engine, this was the Mini in its purest form, a far cry of things to come in the next few years. Called the AUSTIN SEVEN and MORRIS MINI MINOR all models had an 848cc engine and drum-brakes front and rear. DeLuxe versions had 3 instruments and opening quarterlight windows. 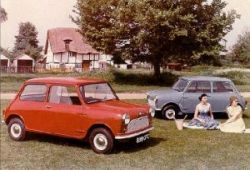 The MINI saloons were joined by estate- versions, COUNTRYMAN and TRAVELLER and by the VAN and PICK UP. Although developed for military use, the MINI MOKE was brought to the public. 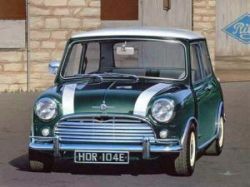 The first MINI COOPER, the 1071 S was introduced with 70 hp along with the 997 COOPER with 55 hp. The Cooper received 7" and the Cooper S 7,5" disc brakes. The Cooper engine was a modified 848cc but the 1071 S engine was a complete new development. All Minis except 850 received remote gearboxes. Three new models were introduced: 970 and 1275 Cooper S and 998 Cooper. The 1071S and 997 Coopers were discontinued. The 998 Cooper had a newly developed 1 Litre engine and the 1275 S was the next step in the Cooper S series. The 970 S was a pure racer built almost solely for the 1 Litre class with less than 1000 in total production between 1964 and 1965. One of the production changes that affected all models, was the introduction of Hydrolastic suspension. The Cooper S achieved super-star status when the 91bhp Works spec cars won the Monte Carlo Rally outright for 4 years running from 1964-1967 (although the Minis were disqualified from the 1966 rally for having faulty headlamps!) . The MINI MKI was replaced by the MKII which meant bigger rear lights and a larger rear windscreen. Companies such as Radford and Wood & Pickett who made their name tailor making Rolls Royce's and Bentleys now were turning their hands to Minis, with everything from electric windows and leather seats, to wickerwork sides and hatch backs. The MINI MOKE MKI is discontinued. The Moke was later licence-built by other countries. 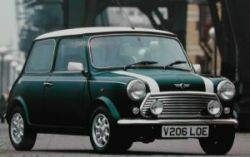 With the introduction of the MINI CLUBMAN, the last of the MKII 1275 Cooper S and 998 Coopers were built. The Cooper S engine was discontinued and replaced by the Cooper S MKIII engine which didn't have anymore tappet covers. The 1275 Clubman GT engine only had 9 cylinder head bolts. The new 998cc engine only put out around 30 hp. Rubber-cone suspension was reintroduced to all models. The MINIs were found with 850cc, 998cc and MINI CLUBMANs were found with 850cc, 998cc, 1098cc and 1275cc engines. All Minis took over the Clubman concept of wind-up windows and had the door-hinges moved out-of-sight. The 1275 COOPER S MKIII was discontinued. Only in MINIs built in foreign countries e.g. the Italian B39 Innocenti Cooper or Spanish MINI 1275 GT, did one still find the MKIII S engine up until 1975. 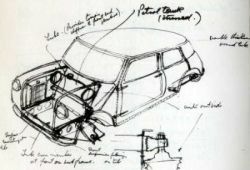 The 998 Cooper engine could be found in the B38 MINI 1001. The remote change gearbox was replaced by the rod-change type. The Mini Clubman 1275 GT received 8" disc brakes and 12" wheels. Front sub-frames were rubber-mounted from here on. The MINI also received the 1098cc engine. 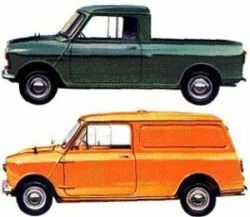 The MINI VAN, PICK UP, CLUBMAN, the 1275cc A-Series and the 1098cc engine were discontinued. In this year the A-Series A-Plus engine from the METRO was introduced to the MINI. From 1981 to 1989 there was no 1275cc engine actually built into the MINI by the factory, except for the E.R.A.TURBO in 1988. In May of this year the last of the 10" wheel-MINIs left the factory. It was the rebirth of the Clubman 1275 GT´s 12" suspension in all MINIs. The 850cc engine was discontinued. 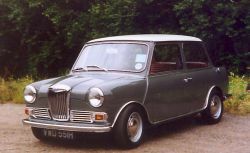 The first ROVER MINI COOPER 1275 left the production line with 62hp. The 998cc engine was discontinued and all MINIs received one of the two 1.3i engine versions with either 54 or 63hp. The latest 1275cc MINI is introduced to the press on the 1st October. Modifications include the radiator moving in front of the engine (new front panel), a 2-point injection system, an MGF-type steering wheel with air-bag, reinforced doors and a seat-belts tensioning system. The cylinder-head casting has a bracket included for the raised alternator. The new A-Series engine has the highest torque ever, but is strangled with a differential-ratio of 2.71:1. The oil filter has moved near the clutch housing. 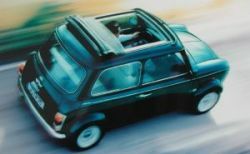 The re-launch of the Cooper in 1990 brought about a much needed revival of interest in the Mini, particularly in Japan. The 90s Cooper initially had a 63bhp 1275cc carb engine, then in 1991 had an injection version of the same engine. 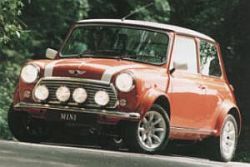 Perhaps the biggest change in the Mini came about in 1997 with the introduction of the twin-point injection engine with a front mounted radiator, this engine was introduced as standard in both the Mini and Cooper models along with safety features such as airbag and side impact bars in the doors. Along with this modernisation came the 'Sportspack' option which included 13in alloy wheels, large wheel arches. The final Mini rolled off the production line on the 6th October 2000. Range expanded to incorporate estate versions. Riley and Wolseley booted versions introduced. introduction of Porsche Baulk ring Synchro. Hydrolastic suspension incorporated, and then dropped in 1969. Wind-up side windows incorporated on Riley/Wolseley models. Synchromesh replaced and gear-change improved by having synchro on first gear. Clubman version added, incorporating Maxi-like front-end styling. Wind-up windows incorporated on the rest of the range. 1275GT Clubman-based model now the only sporting version after the Cooper S is discontinued. Dynamo replaced by alternator for the electrical system. Rubber mounting for the front subframe, to improve driveline “snatchiness”. A-Plus engine added, cars now built on Metro production line, Clubmans dropped. Wheel diameter increased to 12" in order to accomodate larger brakes. Special editions start to appear thick and fast. Lamm convertible version launched, Longbridge versions appear in '93. “New MINI” launched, but is it the car the British would have produced ?